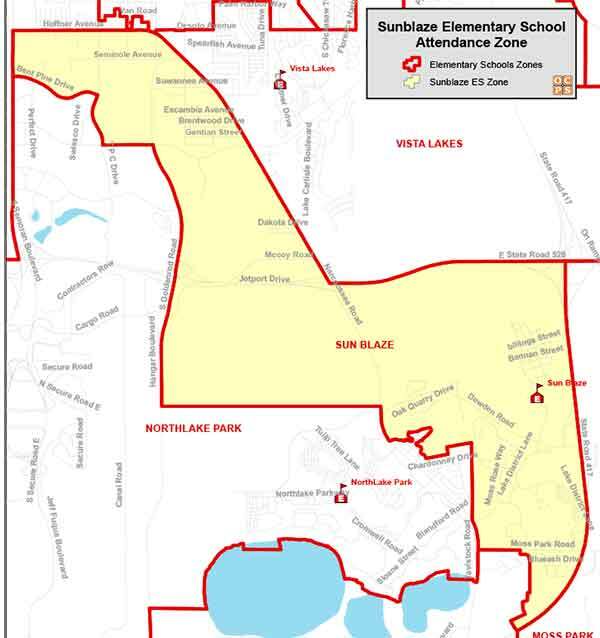 Searching for a home within the Sun Blaze Elementary School Zone? Then you are in the right place! We work hard to make your next home search easy and efficient, so that when you are ready to buy or sell, we are ready to help! Sun Blaze Elementary School History and Information: Sun Blaze Elementary School is a modern two-story building that opened in August 2013 in the Randal Park subdivision of southeast Orlando to relieve overcrowding at North Lake Park Community School and Vista Lakes Elementary School. During the first year, 640 students were enrolled, and 51 teachers and resource staff. Just five years later there are more than 1,100 students and 123 total staff. Fifteen portable classrooms have been added to the campus to accommodate the rapid and substantial growth, additional portables will be added in the near future. Sun Blaze Elementary School has been recognized as an "A" school five consecutive years by the Florida Department of Education for the high level of performance that students demonstrated on statewide testing during the school year. Parent and community support has been one of the hallmarks of the school's success.